Mike Taylor(@herrison) has worked at Elsevier for 16 years, the past four as a technology research specialist for theElsevier Labs group. In that role, he has been involved with the ORCID Registry. His other research interests include altmetrics, contributorship and author networks. Details of his research work can be found on the Elsevier Labs website . He is based in Oxford. [divider] Since the launch of the ORCIDFoundation, it's been ambition of the founding technologists to encourage community development and collaboration.The ORCID/Dryad Symposium on Research Attribution and Codefest in Oxford last week provided the perfect opportunity for like-minded technologists and coders to come together with the ORCID technology group. About 30 people gathered in a seminar room in St. Anne’s College at the University of Oxford. 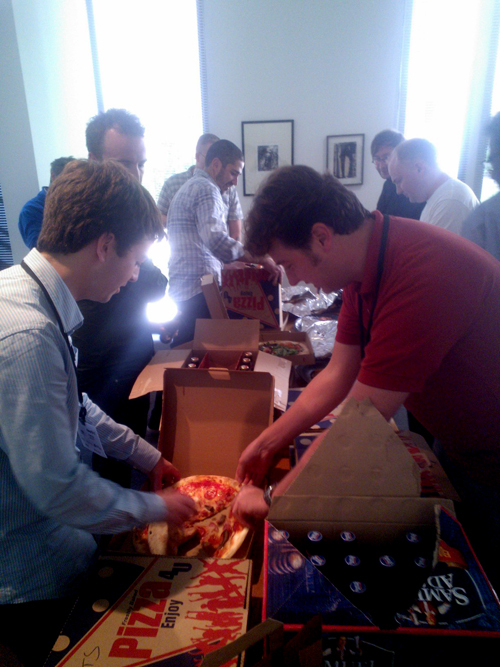 With fuel in the form of the pizza and beer provided by Elsevier Labs, the groups sat down and brainstormed, shared ideas and code, techniques and trade secrets. Between them, they created some exciting ideas for how to combine ORCID's 140,000-strong database of researchers with CrossRef data, altmetrics from ImpactStory.org, funding data and Google Maps. Then, after deciding on their tasks, team members headed off to their own computers, the most common being the MacBook Pro.After a day's hard work, the teams took turns showing off their work. Some tools showed a great deal of promise for the future, some worked without any problems – and some were working just half an hour ago, the presenters promised, but now were mysteriously broken. Then the participants put on a different hat – they became the judges. They discussed the merits and demerits of each application and nominated two winners. 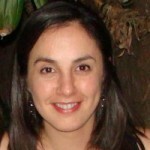 One winner was Dr. Alejandra Gonzalez-Beltran, a software engineer for ISA-tools. She showed us how she had integrated ORCID with the ISA-creator tool. ISA-tools is part of a project run by the Oxford eResearch Centre, and is part of a suite of products designed to help researchers manage the increasingly diverse set of experiments in the life, environmental and biomedical sciences. The other winner was our very own Roy Boverhof (@Boverhof), who worked with Ram and me to build a new service called orcidLIVE! Visitors to orcidLIVE.org can see notifications of where in the world ORCIDs are being created and edited. Ram provided the Google Maps support, while Mike documented the various connections between ORCID and OrcidlLIVE! 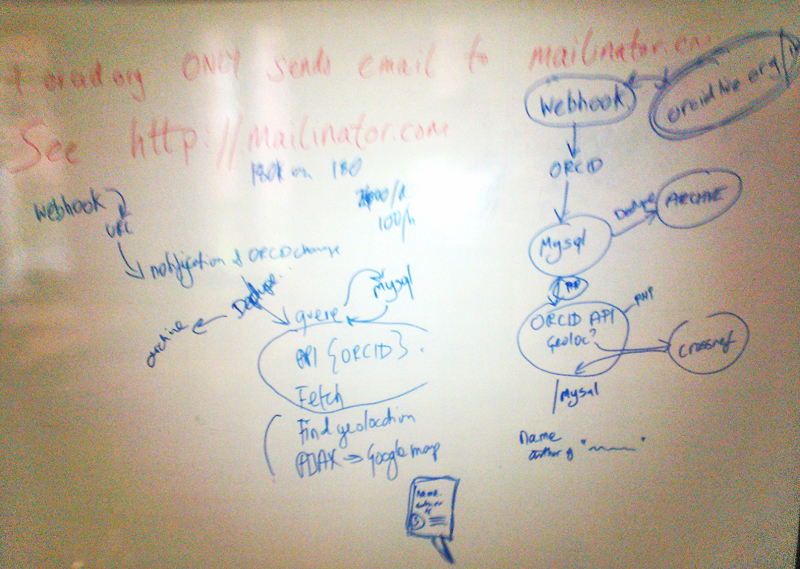 The application was built using new code freshly written by ORCID developers, and although there are some problems – most notably, ORCID can't yet notify third parties of new ORCIDs and is not yet loaded with all ORCIDs – Roy was able to demonstrate a working map that can provide a valuable insight into ORCIDs international outreach. On orcidLIVE! visitors can see where in the world ORCIDs are being created and edited. ORCID (the Open Researcher and Contributors ID repository) is an open, nonprofit, community-based effort to create and maintain a registry of unique researcher identifiers and a transparent method of linking research activities and outputs to these identifiers. Researchers can register for a unique ID, which can be used by editors, funding agencies, publishers and institutions to reliably identify individuals in the same way that ISBNs and DOIs identify books and articles. To register, researchers should visit the ORCID website, orcid.org, where they can create a complete online record of their research and publications. This ORCID can be used as a linking identifier throughout the entire chain of the scholarly communication process to allow reliable attribution of research. Dryadis a digital repository that stores and allows for citation of experimental data assets. A nonprofit agency, Dryad is governed by a membership organization. Rather than specializing in a particular discipline, Dryad is a multipurpose repository, proving a home for a wide range of datatypes. Dryad is a grant-funded organization.